What Obvious Engineering Disaster Was Weirdly Put Into Production? Some ideas people just know are bad, even before they make it off the drawing board. And then, for reasons beyond most comprehension, someone goes and builds those ideas anyways. Beyond all common sense. 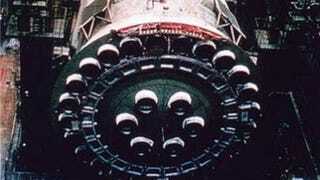 Ideas like the Soviet N1 Moon rocket. We’ve talked about the disaster that was the N1 before, but if you haven’t read about it, it was the Soviet Union’s answer to the Saturn V rocket that powered the American Moon landings. Building an insanely complex rocket to take you to the Moon is hard enough, but when the Soviets did it, they decided to add just a bit more complexity than is necessary. By building the main stage out of not five big engines, like the Saturn V, but thirty little tiny engines, all strapped together, all with their own little problems that could go wrong. And go wrong they did. When one of the N1 rockets exploded, it was one of the largest non-nuclear explosions in human history. But it wouldn’t exactly take a rocket scientist to figure out why strapping 30 little engines together wasn’t the best idea in the world. The thing that got me onto this line of thought was a conversation I was having with one Raphael Orlove, about the design of Honda’s new Formula One engine. The big idea behind it was to minimize packaging, the engineers nestled the turbo inside the engine itself. Which is great, until you think about the fact that Honda hasn’t won any races. And Mercedes has been so successful partially because they split their turbo, cooling the gases that give it so much power, and until you think about the fact that engines tend to be, well, very hot. And Honda’s had some cooling problems. Which maybe a non-engineer could’ve seen coming. I dunno. That’s just me. Raph disagrees. But I digress. Which other obvious engineering disaster (in hindsight) somehow got off the drawing board? Let us know in the comments below, safe in the knowledge that you’ll be annoying actual engineers.